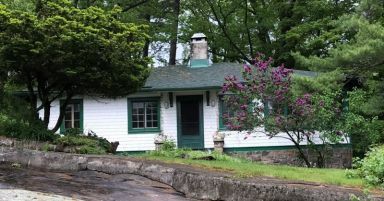 All waterfront cottage rentals are unique and provide differing levels of amenities. Unless stated, all properties have electricity, hot and cold running water, flush toilets, blankets, pillows, cutlery, dishes and pots/pans provided. LINENS ARE NOT PROVIDED. Guests must bring their own sheets, pillowcases and towels. If you are planning on bringing a computer and/or fax machine, that will require a telephone line. Please be aware that some of the more rural properties may not have "touch-tone" telephone service. If this is a requirement for your vacation, please ask us to confirm the type of telephone service for you, prior to making a booking. Also, note that cell phone reception may be limited in some locations. Also, some rental cottages may have a "block" on long-distance usage on their telephone preventing any long distance calls. Regardless of whether there is a "block" or not, long-distance calls must always be charged to a calling card or another number. Televisions, when provided, may have poor and very limited reception depending on the cottage location. Although there is a tv listed with the cottage, they may not even have an aerial and the tv can only be used with a DVD or VCR player. Charges for pay-per view satellite will be charged to your security deposit. The supply, if any, of drinking water requires particular attention as it can vary greatly from one cottage to another. Most, but not all, vacation properties are serviced with either a private well and/or a surface water source such as a lake or river. Depending on the amount of treatment the lake water gets, it may, or may not, be safe for drinking. In most cases, you will be required to bring your own drinking water. Upon booking a cottage, you will be advised as to whether this is the case. Cleaning service is NOT included in the rental. The vacation properties available are not commercial operations, but rather, somebody's treasured summer home in which you are a guest. You are responsible for cleaning the vacation home to the same standard as it was on your arrival. If you are unable, or unwilling (this is your vacation after all! ), to perform the necessary cleaning, it may be possible, with reasonable notice and at an additional fee, to arrange cleaning with a commercial service operating in the area. Please call our office for a list of cleaning services. 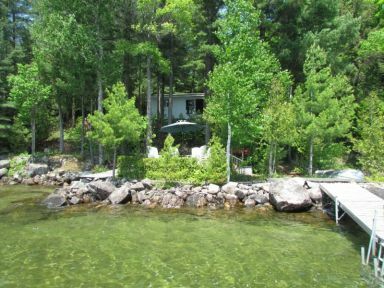 Most, but not all, cottage properties are serviced with a private sewage disposal system, usually a septic tank system. Usually, there will appear to be no difference between a septic and a municipal system to the user. However, septic systems require a little more care in what may be disposed in them. If you are not familiar with septic tanks the basic usage rule is: paper, preferably one-ply and human waste only to be flushed into the system. Serious, very expensive and unpleasant results can follow if this rule is broken. This is an expense that may be charged back to the renter. Upon booking a cottage, you will be advised of the garbage disposal requirements for that particular property. In all cases, garbage must never be left at the property, or, left available to wildlife (bears) during your stay. Always put the garbage out on the morning of the pick-up day. In some cases, you may have to transport your garbage to a dump some distance from the cottage. If garbage is left at the property at the end of your stay a fee will be charged by the owner and taken from your security deposit. Unless otherwise noted, all cottages have electrical service. In some cases, electrical systems have limitations. Additional electrical appliances, other than what is supplied in the cottage, should never be connected without permission of the owner. Also, power outages in "cottage country" are common occurrences, particularly during summer storms. Usually, the power will come back in a short time. If you experience a power outage, it is very important that you DO NOT attempt to run water and/or flush toilets. Water is supplied, in most cases, by an electric pump (it may be submerged in the well). If lines are emptied, the pump may need to be re-primed when the power comes back on, or, it could be seriously damaged/destroyed if it is run with no water in the lines. Please call us or the cottage owner if there is a electrical problem. In most cases, the cost of propane is not included in the rental. As it just isn't feasible to have the owner, or each renter, top up the tank between each rental it is your responsibility to refill it when it becomes empty. Most owners provide two tanks so that a mid-meal preparation delay shouldn't be encountered. Also, a scrub of the grill at the end of your rental is greatly appreciated. When a boat with motor is included in a rental, please leave the tank full of gas/oil, as per the cottage owner's instructions, at the end of your rental. Most owners do not include motorized boats in their rentals. Please be sure that anyone operating a boat has the proper watercraft license. The owner is responsible for lawn maintenance. As some renters prefer to perform this task themselves, your preference should be stated at the time of booking. Please note, that tents and trailers are not allowed on rental properties and firepits must not be made. As most cottage properties are also used regularly by their owners some food, cleaning and paper supplies will be found on the premises. Please replace whatever is used. Most properties will also have a list of household rules posted by the owner. Please respect the owner's wishes and follow their rules. 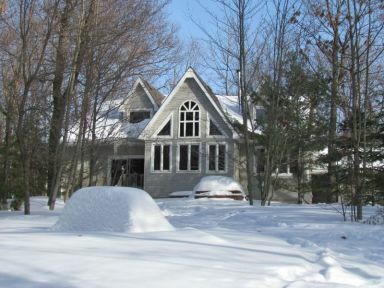 Various "extras" are often included with a cottage rental. These may include such items as entertainment equipment (e.g. tv/vcr), watercraft (e.g. canoe/rowboat), appliances and/or outdoor furniture etc. Please note that the available extras are confirmed annually with the owners and are deemed correct at that time. However, due to circumstances that can be beyond our or the owner's control, such as breakdowns etc. some items may become temporarily unavailable at a property. Every effort is made to ensure that you are informed of any substantial changes that would affect your vacation significantly, however, lack of an item is not deemed to be a reason for a partial refund. Any entertainment, watercraft or extras are subject to change due to unforseen cirmcumstances.